NBC and Universal have announced LEGO Jurassic World: The Secret Exhibit, which will serve as a prequel to 2015’s Jurassic World. The two-part animated special will air on November 29th at 8pm ET/PT. This is pretty awesome news for Jurassic Park fans who have been hoping to get some extra information about the events leading up to Jurassic World. 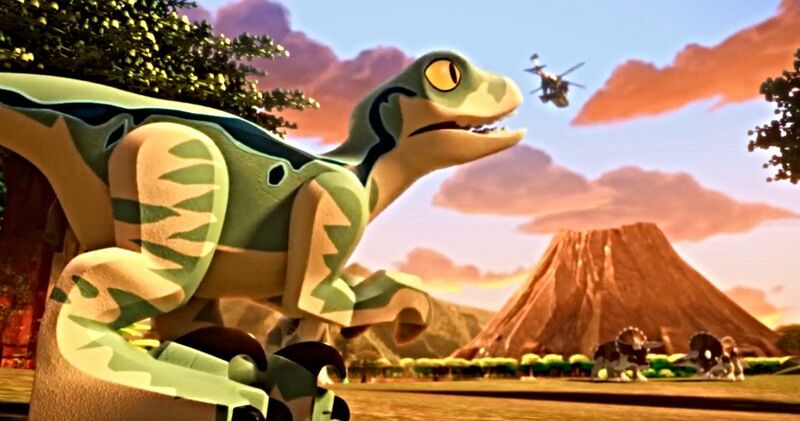 And the short trailer brings the LEGO animation that we’ve come to expect over the years, with some awesome dinosaurs that are sure to get all the dino fans pumped. LEGO Jurassic World: The Secret Exhibit begins with the grand opening of the Jurassic World mysterious dinosaur exhibit just days away. However, only one thing is missing, which is the dinosaurs. Simon Masrani has to enlist his newly-hired assistant, Claire Dearing, to make sure that the new attraction opens on time. Unfortunately, Owen Grady, the animal behaviorist Claire hired to deliver the dinosaurs, is running late. Things start to get a little dicey for both Owen and Claire in the trailer. The mission to bring the dinosaurs into the park proves to be much harder than originally thought, which leads to some fun and hijinks along the way. LEGO Jurassic World: The Secret Exhibit trailer teases some games of chicken with a T-Rex and an insane hang gliding mission, that makes sure that Owen Grady is getting his full paycheck. However, the coolest part just might be when Owen meets Blue for the first time. Even with the LEGO aesthetics, the two-part animated special looks like a must-watch for all fans of the Jurassic Park franchise. While also serving as a prequel to Jurassic World, LEGO Jurassic World: The Secret Exhibit gives explanations for some of the dinosaur species, including the Carnotaurus and Stygimoloch, that were spotted in Fallen Kingdom. Fittingly, the dinosaurs shown off all have corresponding LEGO sets, which means that this is also some pretty prime product placement for the upcoming holiday season. It has been rumored that some new Jurassic World LEGO sets will be released in early 2019, so there might even be some teases of those new sets in the prequel special when it airs later this month. LEGO Jurassic World: The Secret Exhibit will air in the U.K. on December 6th, one week after the North American debut. The prequel special will hit streaming platforms on November 30th, and a special edition Blu-ray will be released January 15th, 2019. The Blu-ray special contains exclusive bonus content as well. LEGO fans are hoping that the Baryonyx set will be the next one released, and might be teased in the prequel special. We’ll just have to wait until the end of the month to find out. While you wait, you can check out the trailer for LEGO Jurassic World: The Secret Exhibit below, provided by the Jurassic Outpost YouTube channel.